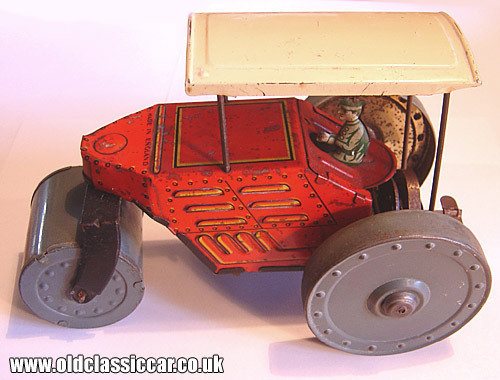 Tinplate clockwork road roller by Mettoy toys. Clockwork roller made from tin-plate. Old wind-up toy road roller. I believe this was made by Mettoy although there is no mention of their name on this toy steamroller. Actually it may not be a steam roller at all - bonnet air vents and side exhausts pressed into the toy's body suggest that it may be based on a diesel roadroller rather than a steam-powered example. It is made from tinplate throughout, including the driver which is made from two pieces joined together. A clockwork motor powers this particular toy, and in action it resembles a real-life road roller in that it goes forwards for a short distance, then reverses back over the same distance automatically, before repeating the sequence once again. If anyone can confirm that this is a Mettoy roller, it'd be appreciated - the 'Made in England' lettering across the top of the front would add to this theory. Did they also do a toy steamroller, as well as this internal-combustion engined roller? Measures: 7.75" or 195mm long. Colour: Red, cream roof, grey wheels.